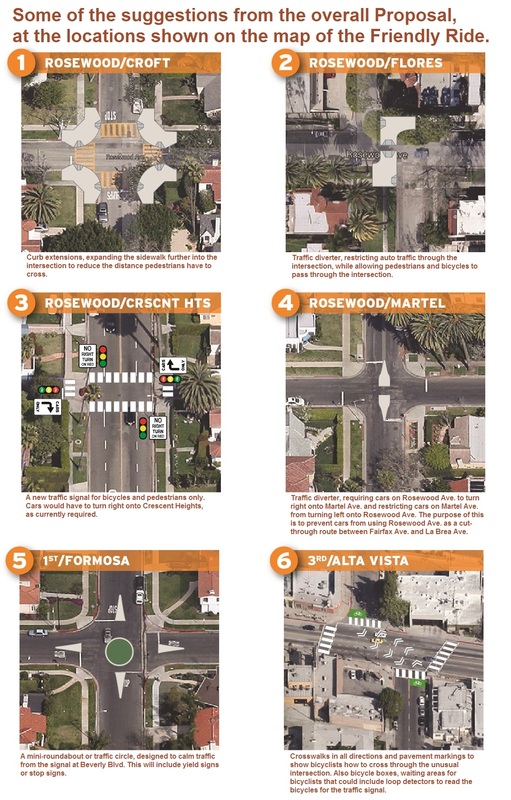 Last year the Mid City West Community Council (MCWCC) created a proposal for a number of “Bicycle Friendly Streets” in the area. The idea is to use residential streets as bike routes and add traffic calming and diversion elements, including roundabouts, curb extensions, and vehicle limitations. The MCWCC proposal involves two bike routes: an east/west route on Rosewood Ave. from La Cienega Blvd. to La Brea Ave., and a north/south route starting at Formosa Ave. and Romaine St. on the border of West Hollywood and Melrose Village and traveling south on Formosa Ave., Alta Vista Blvd., and finally Cochran Ave., south of 3rd St.
MCWCC is holding an event called the Friendly Ride next Sunday November 9th starting at 10 a.m. This starts at Alfred Coffee at the Melrose Place Farmer’s Market and ending at Milk Jar Cookies on the Miracle Mile. They will stop to discuss proposed changes at six locations along the two bike routes. (See the map below.) It’s not necessary to ride a bike to participate. 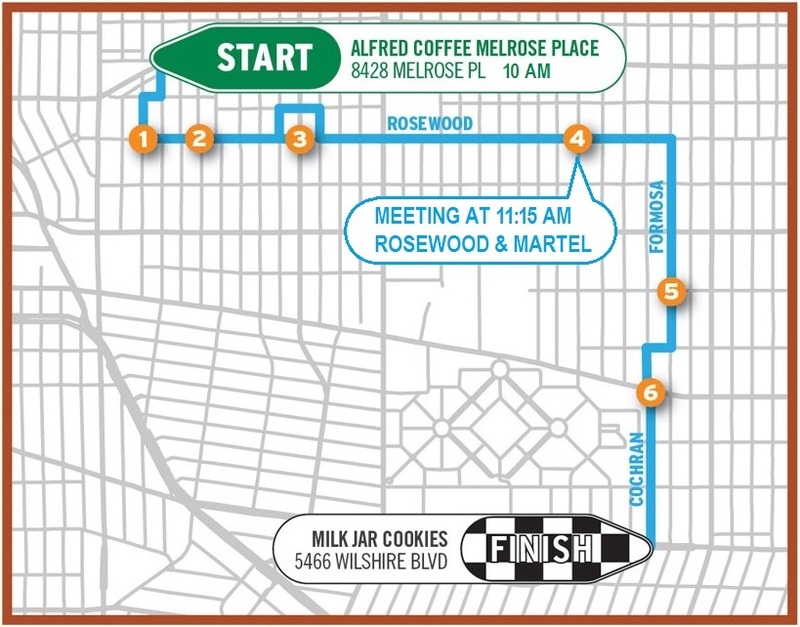 Non-riders can join the pre-ride presentation at Alfred Coffee, the post-ride discussion at Milk Jar Cookies, or at the intersection of Rosewood Ave. and Martel Ave. at 11:15 a.m., where the proposed traffic diverter will be discussed. For more details see the page for this event on the midcitywest.org website or on Facebook at https://www.facebook.com/events/466594806816741/. Bike friendly routes are a great idea—thank you! !